On Wednesday, July 12, I gave a talk entitled, Has Neoliberalism Gone Too Far? And if so, where do we go from here? as part of a panel discussion at the Bank of England on the theme of “The Big Political Economy Questions of the Next Five Years.” The event was sponsored by The Sheffield Political Economy Research Institute (SPERI), and the purpose of the special event and reception, hosted by Andrew Haldane, Chief Economist of the Bank of England, was to celebrate SPERI’s work over the last five years and to explore new ideas to shape SPERI’s agenda for the next five years. I was joined on the panel by Gavin Kelly, Chief Executive of the Resolution Trust, and Dawn Foster from the Guardian. Prof. Sir Keith Burnett, President and Vice-Chancellor of the University of Sheffield, chaired the event. You can read my remarks on the SPERI website or below. Neoliberalism has gone too far: it has undermined democratic capitalism—by which I mean both liberal capitalism and liberal democracy. We are experiencing the backlash today in the rise of populism, reflective of citizen discontent. The question is: what will replace neo-liberalism? Where do we go from here? To answer, we begin by where we are coming from: the neo-liberal sources of current discontents. The political economic sources come from the continuing resilience of neo-liberal ideas about how to govern the economy. This began with a focus on global free trade and ended with the triumph of financial capitalism and ‘hyper-globalization.’ Neoliberalism has pushed deregulation too far (viz. the Grenfell tower tragedy), and still lacks adequate international regulation (viz. Apple’s sweetheart tax deals in Ireland, or the very rich in Panama tax havens). Financial market liberalization is responsible for the financial crisis of 2008—and will be for the next one, coming soon? from shadow banking? It is also to blame for the sovereign debt crisis, where the Eurozone’s ‘ordo-liberal’ response of ‘governing by rules and ruling by numbers’ only made things worse, taking austerity and structural reform much too far. 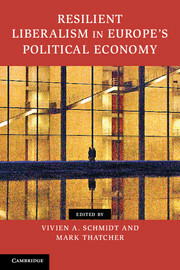 The socio-economic sources of discontent follow from the political-economic, and include the massive rise in poverty and inequality—at levels we have not seen since the early 20th century—combined with the increasing numbers of people left behind with lower incomes, stagnant wages, worse jobs, ever since the 1970s…and no end in sight. There are also purely political sources of discontent—clear in a populist upsurge not seen since the 1930s. As neo-liberal globalization (and Europeanization) has moved decision-making up to the supranational level, national governments find themselves caught between being responsive to citizens’ demands and being responsible for upholding supranational agreements. This means, in particular in the Eurozone, that governments may promise great new initiatives in campaign mode, and then deliver exactly the same as their predecessors. This has left citizens with a sense of loss of control along with growing distrust of governing elites and a loss of faith in their national democracies as well as in supranational governance. Put together, this helps explains the increasing turnover of incumbent governments, the high rates of abstention in elections, and the turn to populists. It is no wonder, therefore, that in the UK, the Leave campaign slogan ‘Take back control’ resonated so much, as similar such slogans have across Europe. Or that Trump’s ‘America First’ did the same in the US, despite unfortunate echoes of a nastier past. But populism is not the answer. In the UK, Brexit is a self-inflicted wound that used the EU as a scapegoat for very national problems linked to neo-liberalism gone too far—as evidenced by the anti-austerity focus of opposition in the snap election, and the ‘dementia tax.’ And let’s not talk about Trump in the US…with his curious mix of anti-neo-liberalism on trade and ultra neo-liberalism in his anti-regulation agenda, tax reduction for the rich, and benefits reduction for the poor. So how to move forward? We need to tackle the problems at the sources of discontent. We need more equality, less poverty, more ‘social justice’, fair wages, a reining in of the financial markets, to make them work better for the ‘real economy,’ and did I forget to mention climate change? Plus, we need more decentralization, giving more power and responsibility back to national, regional, and local levels, even as we intensify coordination at supranational regional and global governance levels. How do we get there? There is no appetite for global governance, and yet some things can only be done at the international level. At the national level, new governments could be elected with new majorities able—if they are willing—to tackle the national sources of the problem. At the regional level, in particular the EU, where there is no ‘government’, have to hope for new national governments to provide EU leadership. The way forward is the hard work of incremental change in ideas… where we don’t know what the new is until we have been living it for a while…only years later, looking back, was FDR’s bricolage in the US 1930s labeled neo-Keynesianism. In other words, the way forward requires new rhetorical leaders and ideational entrepreneurs—to win elections with a new set of ideas. Not a Trump—there are no new ideas here, just bad, VERY BAD old ones (to use his language, and hand gestures)—but possibly a Macron…whose bricolage of ideas from the left and the right, to make something new, might be just the ticket. As for the Eurozone, here too there has been significant incremental change: the EU Commission went from ‘governing by rules and numbers’ in 2010 to 2012 in the European Semester to reinterpreting the rules ‘by stealth’ to allow for more flexibility from 2012-2015, and since then to the politics of flexibility, with more legitimizing debates with the Council and the member-states. We could imagine that in the near future that the EU will be seen to have gone from its original ‘paradigm’ of ‘expansionary fiscal contractionism’—the ideas behind austerity and structural reforms (Dellepiane-Avallaneda 2015)—to a new paradigm of ‘expansionary stability,’ or ‘stable expansionism,’ in which the stability rules have been made truly compatible with growth-enhancing policies. As for the governance processes, why not flip the European Semester, from hierarchical top-down instrument of deficit and debt control to a bottom up member-state instrument of industrial policy for national growth and prosperity? Politics in fact is also necessary—with bottom up political movements, and social movements provide of new ideas, and as new ideas bubble up from the bottom. It is tremendously important for liberal democracy, and not just liberal capitalism, to give back control, meaning give national governments power over their economies, with more control over market forces, and allow much more regional and local autonomy, international and national … since cities and sub-national regions are often where experimentation and innovation begins. Open markets, yes, but not just with recompense for the losers, but ways to turn losers into winners. This is the last chance for western industrialized democracies that have pushed capitalism too far. We need a renewable of liberal capitalism combined with a renewal of democracy. And for these, we need to ensure the incremental change in good new ideas…otherwise, thing will be, to paraphrase Trump, A DISASTER!!! Posted on July 13, 2017 July 26, 2017 Author edamrienCategories Events and ConferencesLeave a comment on Has Neoliberalism Gone Too Far? And if so, where do we go from here?